Welcome to another instalment of Brian’s Travel Spot. This is part of my series on Vietnam, which started with my flight over, and which, logically enough, would conclude with this, my flight back However, I’ve long since given up on assuming that there will be any logic to the order of these posts, so while you still await my thoughts on Vietnam itself, the final instalment of my three-part series on Vietnamese Coffee and the culmination of my trip up the coast by train, here’s a piece on my flight back from Vietnam, which marked, in another first for me and the Coffee Spot, a long-haul flight in business class. I should point out that I do have this dream that at some point in the (hopefully not too distant) future, loads of free time will magically appear, allowing me to go back and complete the outstanding Travel Spots. These will then form a coherent narrative, full of useful information for the fellow traveller. Of course, knowing how these things go, it’ll take me ages, by which time they’ll be hopelessly out of date. Plus, of course, I’ll have to completely re-write this introduction. We’ll get to the actual flight after the gallery, a brief round-up of my time in Vietnam. I’ve never actually flown long-haul in business class, largely because I’ve always looked at the price and gone “how much?” in horrified tones! Years ago, when someone else was paying, I flew business class on a short-haul flight and, on another occasion, also a short-haul flight, I was upgraded, but that’s the limit of my experience. On both occasions, I was not that impressed. Yes, the seats were bigger, yes there was more room, and yes, the service was more attentive, with more choice in what food was on offer. And, in a move that I still to this day do not understand, you are given real, metal cutlery: sharp, stabby forks and knives with genuine blades, the sorts of things that will get you pulled to one side if you try going through security with them in your hand baggage. Clearly, terrorists are incapable of affording business class fares, nor can they force their way past the impenetrable curtain that separates the back of the plane from the font. I looked at what you got for your money, looked at the amount of money itself, and decided that flying business class is simply not worth it. This is particularly so now that I’ve worked out just how cost-effectively I can travel in economy while paying for an exit-row or bulk-head seat, which gives me everything I need at a fraction of the cost. However, this year, I’m flying on business, so someone else is paying. Naturally, you’d think I’d be going everywhere in business class. Not so fast. I have what I consider to be a very generous travel budget, but this covers six meetings a year, so I need to find the funds for a week in a (rather expensive) hotel (times six), six return flights (five, actually, since one of this year’s meetings is in Manchester) and any sundry expenses on top of that. While the travel budget is generous, allowing me to stay hotels I would never afford for myself and paying me to fly all over the world, it still doesn’t stretch to flying business class. Just to give you an idea, the cost of a typical business class return flight to the US could easily eat up the entire travel budget for one meeting, while the equivalent economy flight (including the cost of the exit-row seats) is maybe one quarter of that. There’s one important caveat to this. I’m talking here about flying with the major western airlines, the British Airways & Virgins, the KLMs, Air Frances and Lufthansas, the Uniteds, Deltas and Americans, the Air New Zealands, Quatas and JALs of this world. As I discovered last year when flying from Shanghai to Chicago, you can get some very good deals when flying with other airlines, and my personal experience is that the service is every bit as good. With all this in mind, I’ve tended to automatically rule out flying business class and was all set to book an economy flight. Then one of my colleagues told me the price of a business class return with Vietnam Airlines and suddenly flying business class seemed like a real possibility. You can read more of my reasoning after the gallery, which covers my flight out (and which you may have already seen). 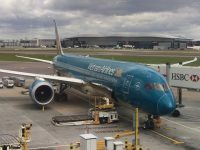 Other than the price, one of the attractions of Vietnam Airlines is that it’s the only airline offering direct flights from London to Vietnam. While I’m no longer as averse to taking multi-leg flights as I was, I’d still rather fly direct given the choice. Vietnam Airlines flies daily from London Heathrow to Ho Chi Minh City (Monday, Wednesday and Saturday) and Hanoi (Tuesday, Thursday, Friday and Sunday). Each flight starts in Vietnam, leaving just after midnight, arriving in London not long after seven o’clock in the morning on the same day. The return flight then leaves London at 11 o’clock that morning, arriving the following morning in Vietnam at around five o’clock. When planning for this trip, I wasn’t quite sure what I was going to do in Vietnam, so I decided to fly in/out of Ho Chi Minh City and book my tickets while they were relatively cheap. Then, with a little more time to plan, I worked out the rest of my trip, ending up with a plan to take the train from Ho Chi Minh City to Hanoi, stopping along the way. With all that in mind, it was time to book my flights. Vietnam Airlines’ website gives the price for each class on each leg of the trip, allowing you take a mix-and-match approach to the trip. I did look into booking the whole trip in business, but that would have put me well over budget, particularly as the price of the flight out was about £1,000 more than the flight back. The joys of demand-led pricing! There was another consideration: the flight out leaves at 11 o’clock in the morning and takes 12 hours, so although it arrives at five o’clock in the morning Vietnam time, I’d be flying all day as far as my body clock was concern. For me, at least, the top attraction of flying business class is that I can actually lie down and get some sleep, something (the lying down part) that I can’t do in economy. Now, I could sleep in my seat in economy (or premium economy for that matter), but unfortunately, I’m at high risk of deep vein thrombosis (DVT) so it’s an exceptionally bad idea. Hence I spend night flights in economy, struggling to stay awake, working on my laptop and regularly getting up for a wander. Hence the attraction of business class for a night flight: I can actually get some sleep. But for a day flight, where I’m unlikely to want to sleep? Not so attractive. If I’m going to be awake and working anyway, I can do that just as well in economy. Although, sitting in my pod as I type this somewhere over Russia on the flight back, I have to say it’s a lot nicer working on my laptop in business class than sitting back in economy. Just not that much nicer that I’d pay for it myself! So I ended up flying economy on the way over and business on the way back. I also needed to add on the flight down from Hanoi a couple of weeks after I’d booked the Ho Chi Minh City flights. I looked at doing this in economy, which was around £90, but since business class was just under £200, I thought I may as well do the whole return trip in business class, which turned out to be an excellent choice. After all this, the round-trip cost was a shade over £2,500, which sounds a lot when I type it here, but was still within my budget. If you’re interested, this roughly breaks down as £700 for flying out in economy, while returning in business class cost £1,800 including the flight down from Hanoi. Obviously prices will vary depending on the specific flights and how far in advance you book. For example, if you plan ahead properly and book this particular trip all in one go, Vietnam Airlines will effectively throw in the flight down from Hanoi for free. With a little more planning and booking slightly further ahead, I could have got the cost down under £2,000. You can read all about my actual experience of flying business class after the gallery. If you’re a regular business class flier, please forgive my naïve awe in what follows. On the other hand, if you’ve never flown business class before, read on in envy. The fun began the moment I arrived at the airport. I was running slightly late, not having adequately allowed for Hanoi’s Friday night traffic when booking my car with the hotel. Looking around, there were long, long queues at check-in, plus I couldn’t easily see where I was supposed to be going for my flight (Hanoi’s domestic terminal is a busy, busy place). Then I remembered I was flying business class. So I just wandered up to one of the business check-in desks where there was one person ahead of me. Within 10 minutes, I was checked in, with my bag checked through to Heathrow and my boarding passes printed for both Hanoi and Ho Chi Minh City. Whether this would have happened if I’d been flying the Hanoi to Ho Chi Minh City leg in economy is anyone’s guess, but as it was, I was very grateful for the simplicity of it. Onto security, where the line was snaking back on itself many times over. My heart sank, until, off to one side, I saw the business/priority/first class lane. With no queue. The next minor hiccup was that my flight was delayed by 30 minutes, but because I was flying business class, I’d been given a lounge pass. So, rather than sitting around at the gate, I toddled off to the lounge, where there was power at every seat, plus free food and drink (although terrible coffee and no cake). After a short break to recharge (literally, in the case of my laptop, metaphorically in my case), I wandered down to board the plane. Once again, while there twenty people at the gate, queueing for economy, I just swanned up to the business person, showed my boarding pass and on I went. The final icing on the cake, a separate entrance onto the plane, straight into the business cabin. I don’t think I’ve ever got on a plane or got to my seat quicker! My next surprise was the plane itself. I’d deliberately booked a flight which was served by a Boeing 787 but in my head, it was a short-haul flight, so I was expecting the sort of short-haul business class seating I’d seen in Europe and America. This, for the uninitiated, is pretty much like economy, but with bigger seats, more leg room and a bit of extra space, but fundamentally, not that different. But no, this was a 787 fully kitted-out for long-haul flying, with business class fitted with individual pods, complete with fully-reclining seats that turn into beds! I was, I have to say, rather overwhelmed by it all. I’ve never been in an airline seat with so many buttons and controls. However, we’ll come to that in the next part. You can see how I got on at Ho Chi Minh City airport after the gallery. I arrived at Terminal 1, for domestic flights, and had to transfer over to Terminal 2 for my international flight home. It’s actually a fairly short (but badly sign-posted) walk over, but given the heat and humidity of a Ho Chi Minh City night (30⁰C and upwards of 80%) I was glad that I wasn’t hauling my large rucksack and only had my carry-on baggage to walk over. I landed at 11 o’clock and my flight wasn’t until one o’clock, so I had plenty of time, but nevertheless, I was pleased that I was flying business class, with my bags booked through. If I’d had to queue up at baggage reclaim at Terminal 1 to get my bag back, then queue up to check in at Terminal 2 before going through passport control and security (where the queues were enormous) it could have been a really tight squeeze. As it was, the only point I had to queue was passport control, but that was maybe for 10 minutes, while security was another breeze through with no queues. I had a similar experience getting on the plane, although quite why people queue to get into economy has always been beyond me, particularly when you’re going to be sitting there for 12 hours anyway. Why queue for the privilege of spending an extra few minutes in your seat? All this meant I had about ninety minutes to kill, giving me time to explore the terminal, which is very fine and modern. I also spend an hour chilling in the lounge (yes, I had another pass), which, while nice, wasn’t a patch on the one in Hanoi. And also had no cakes. Soon it was time for my flight home. You can see how I got on after the gallery. I was on another 787, was pretty much identical to the one down from Hanoi, only this time we had a blanket, a pillow and a little zip-bag full of goodies waiting for us in our pods. Having flown down from Hanoi in an aisle seat, I was in a window seat for the flight home. This time, with over 12 hours in the air to look forward to, I took the chance to familiarise myself with the bewildered array of controls! Flying in economy, I’m used to a tray table, an upright/recline seat control, an armrest and, because I’m in an exit-row/bulk-head seat, a pull-out monitor. And that’s it. Here I had three separate buttons, a hook for my jacket (if I’d have thought of it, I’d have worn one, just so I could hang it there), numerous plugs and sockets, plus a control panel for the chair with 11 separate buttons, most of which I never quite figured out. I did work out how to make the seat lie flat, although I’m not convinced I could tell you which particular set of buttons I pressed, nor am I confident I could do it again without considerable trial and error. Clearly I need more practice! I was also overwhelmed by the storage space. I’m just not used to it. I even had a cupboard of sorts, next to the armrest, although I’ve no idea what I’d actually put in it. There was also a shelf at the far end of the seat under the footrest where my bag could go. Perhaps the best part was the (comparatively) large shelf to the side of the seat where all sorts of things go can. I used it to store my drinks, phone and anything else that I normally put on the seat next to me in economy if I’m lucky enough not to have someone sat next to me! I was even able to lean on it to write postcards. The table was a revelation. I’m used to the fairly unstable fold-out tables in economy exit-row/bulk-head seats, whereas this one hinges out from under the shelf and then folds over to double its size. It’s so big and stable. Even better, back in economy, you’re rather stuck with the table being where it is, which can be a problem if you’re trying to type and it’s either too close or too far away. Here, while the table doesn’t move, the seat does (that’s the one control I did reliably figure out!) so you can get yourself into the perfect typing position. Suffice to say, with a seat that can turn into a completely flat bed, I had more than enough leg room. Talking of space, another huge bonus was that I could actually get in and out of seat without having to put the table away. What luxury! Even making coffee is better in business class. In economy, I’ve taken to making my coffee in the toilets, simply because there’s so little space at the seat. In business, that’s not an issue, given all the space, plus my lovely table. However, I still decided to grind my beans in the toilet, which is standard practice ever since I was told off by the cabin crew on a night flight for grinding my beans too loudly. All I needed was my customary jug of hot water from the cabin crew, and even this was better in business, the crew member pre-heating the jug before filling it up. The flight itself was smooth and uneventful. While I was waiting in the lounge at Ho Chi Minh City, I was so tired that it was hurting just to stay awake. At that point, all I wanted was to get on the plane and sleep. Of course, by the time I’d actually boarded the flight, I was wide awake again and ended up having dinner and watching a movie before going to bed. In the end I didn’t sleep too much, just four or maybe five hours of the 12 hour flight, although that was enough to see me clean across Indian, Pakistan and Afghanistan. I was up again by the time we were over the Caspian Sea and, not feeling at all sleepy, I spent most of the rest of the flight writing a first draft of this Saturday Supplement, although I did catch a small nap after breakfast. The only thing I’d change about the whole flight was where I sat. I’d chosen the second row (of seven) which put me right by the galley. Unlike economy, where the crew largely seem to retire for the night, here the cabin crew were constantly up and down, bringing drinks and snacks for the passengers. So what sleep I did get was rather fitful, punctuated by the tinkle of cutlery and crockery. Other than that, I have nothing but praise for my experience of flying business class with Vietnam Airlines! I’ve now flown business class twice more this year, once on the way back from Chicago on a British Airways 747 and once on a round trip to Shanghai with China Eastern. This entry was posted in Brian's Travel Spot, Vietnam by Brian Williams. Bookmark the permalink.